President Gordon B. Hinckley taught that new converts to The Church of Jesus Christ of Latter-day Saints need three things to help them find their way: a responsibility, good friends, and nurturing with God's good words. Elder Jorge F. Zeballos knows firsthand that the 15th president of the Church spoke the truth. It's been some four decades since Elder Zeballos was counted among the Church's "new converts." From the beginning, he's been the beneficiary of faithful friends, wise priesthood leaders who recognized his vast spiritual potential and a love for gospel learning. "My friends were found at Church — and I had leaders who had the confidence in me to give me a responsibility, despite my young age," said Elder Zeballos, who was called to the First Quorum of the Seventy in April. He was also blessed to have strong teachers who taught him the gospel. It was young Jorge Zeballos' inquisitive mind that drew him to the Church. A native of the small community of Ovalle, Chile, Jorge was 12 years old when he spotted four missionaries who had recently been assigned to his hometown. "I saw them pass by on the street and I thought, 'Who are these young men?"' Elder Zeballos told the Church News. "I was very intrigued. I wondered who these four North Americans were." A short time later, he came across an interview with those same missionaries published in the local newspaper. That story marked the first time the future General Authority would hear the story of the First Vision. He was curious about the message that these unusual North Americans were so anxious to share. He wanted to learn more. A lifelong basketball fan, Jorge was also fascinated to learn that the four missionaries, along with a local Church member, had entered a local hoops tournament under the moniker "The Mormon 5." The makeshift team would go on to win the competition. "I don't know if they were really that good, but to us they were stars," Elder Zeballos said, laughing. Many of his questions about the ball-playing missionaries were answered by a friend at school who had joined the Church. Jorge innocently asked his friend if he, too, would be allowed to attend Mutual and Sunday Church service. The friend, of course, said he was always welcome. Twelve-year-old Jorge attended the tiny Ovalle branch ("there were maybe 15 members attending") for six months before he was baptized. He has not forgotten the moment when his father, Alberto Zeballos, gave his son permission to be baptized and become the first member of his family to join the Church. Elder Zeballos said he appreciates the trust his father placed in him, despite his young age. Such confidence was repeated two years later when his branch president asked him to serve as the branch Sunday School superintendent. He was only 14 and could barely see over the pulpit in the branch meetinghouse. Despite being a convert boy without gospel leadership experience, young Jorge put his all into his Sunday School calling. He would learn while fulfilling his new responsibility that the Lord, indeed, qualifies whom He calls. Before beginning a subsequent call to service in the Chile Concepción Mission, Jorge met his future wife, Carmen Gloria Valenzuela. Carmen lived in a nearby community and the two attended Santa Maria University in Valparaiso, Chile. They became good friends. Carmen Gloria studied the gospel and learned more about the Church that had blessed the life of her friend Jorge. She was touched by the things she learned and was anxious to become a member. She eagerly accepted the missionaries' baptismal invitation. "I baptized (Carmen) — she was my first baptism," Elder Zeballos said, taking his wife's hand. Seven months after returning from the mission field, Elder and Sister Zeballos were married on June, 26, 1982. The Santiago Chile Temple was under construction, so the couple traveled to Brazil to be sealed. Times were tough in Chile. The nation's economy was in free fall even as unemployment rates rose to about 30 percent. They could afford only one-way flights to São Paulo. The return trip home would require several days by bus. "We started poor, with nothing . . . but we had much faith," Elder Zeballos said. Sister Zeballos added she and her husband have long taken comfort in the Savior's words found in Matthew 6:33: "But seek ye first the kingdom of God, and his righteousness; and all these things shall be added unto you." When the newlyweds completed their long journey from Brazil, Elder Zeballos was welcomed home by an attractive job offer in engineering. His career in the Chilean mining industry was later interrupted by a stop at Brigham Young University to claim an MBA. "Mining can be a tough industry," admitted Elder Zeballos. But the rough-edge crowd that can typify the trade always showed respect for the Zeballos' gospel belief. He would be named the manager of corporate affairs for Minera Escondida Limitada, which was at that point the biggest copper-producing mine in the world. Elder and Sister Zeballos point to the gospel and their five children as the center of their lives. For many years, Sister Zeballos has sent each of her children off to school with a kiss and a simple charge: "Remember who you are." That's a message they will continue to share with the thousands of members and others they will worship beside in the coming years as Elder Zeballos travels the world to fulfill his new calling. "The truth is, I'm overwhelmed with this tremendous responsibility," he said. "But at the same time, I am very grateful for the trust our Heavenly Father has in us." Zeballos was born on July 19, 1955. He was called to the First Quorum of the Seventy on April 6, 2008. 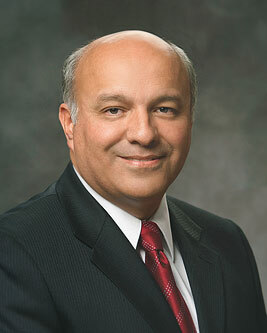 He is the first Chilean to be a member of the First Quorum of the Seventy and only the second Chilean to serve as a general authority of the LDS Church. The first was Eduardo Ayala. Zeballos served as an area authority of the Church from 1995 to 2004. At the time of his call as a general authority, Zeballos was serving as the president of the Chile Concepción South Mission. This page was last edited on 31 August 2015, at 22:13.